The most difficult thing for a Westerner to comprehend is how many years of diligent study of East Asian calligraphy it takes to be able to mesmerize viewers with only a few brush strokes executed within seconds. It seems so easy and effortless when a brush is swung by the rich mind of an old master. Unfortunately, not many people, including even some calligraphers, realize that those studies are based upon in-depth research of the masterpieces of ancient Masters. How often does my teacher lament about the incorrect methods of and superficial approach to studying calligraphy, so common amongst modern teachers. An astonishing number of students learn only from a tehon (手本, てほん, i.e. “example provided and written by a teacher”) rather than from koten (古典, こてん, i.e. “calligraphy classics”). They repeat the style of their teacher, which, in the end, is a complete waste of time. Often, I go to exhibitions and see works all written in the same style, following that of the founder of a given calligraphy organization. It is not only sad but also alarming. Figure 1. My daily study of rinsho. In this picture I am working on the details of the calligraphy entitled “Letter carried by the wind” (風信帖, ふうしんじょう, fūshinjō), the most famous Japanese calligraphy in semi-cursive script (行書, ぎょうしょ, gyōsho), written by Kuukai (空海, くうかい, Kūkai, 774 – 835), brilliant calligrapher, Buddhist monk and scholar of the Heian period (平安時代, へいあんじだい, 794 – 1185). If you study calligraphy seriously, then rinsho (臨書, りんしょ, i.e. “[copying] studying masterpieces”) should be the air you breathe, the time that ticks quietly away in the background of your secluded studio, the theme of changing seasons of the year, your daily meditation repeated until your days end. Rinsho is to a calligrapher as water is to life on Earth. One does not exist without it, and consequently, one does not deserve to be called “a calligrapher” if one does not practice it. Some calligraphers in ancient China set forth an aim for themselves to study at least 1000 characters a day from a chosen masterpiece, all before eating breakfast. Others tended to write even more, as many as 10,000 characters. The famous calligrapher of the Sui dynasty (隋朝, pinyin: Suí cháo, 581 – 618 C.E. 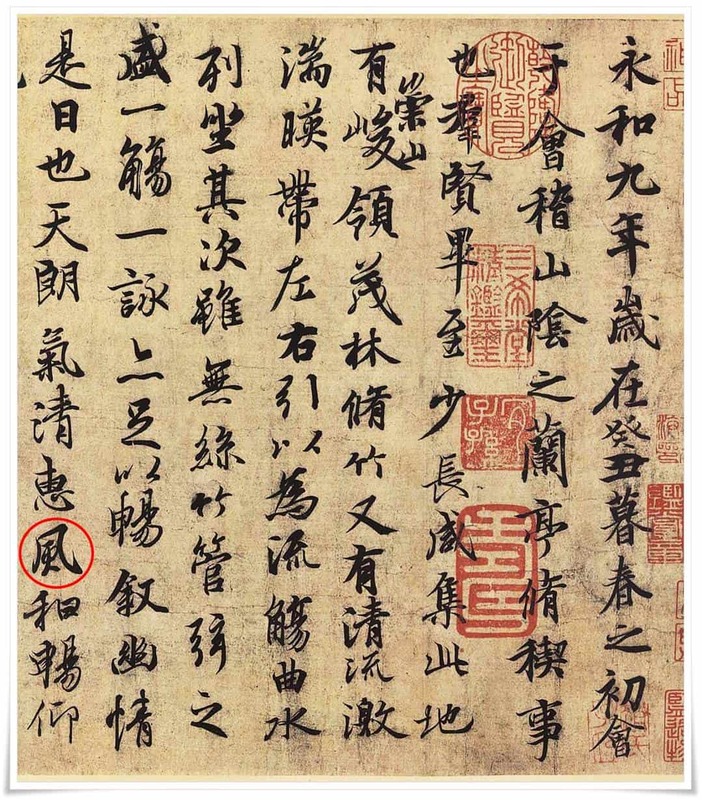 ), Zhi Yong (智永, pinyin: Zhì Yǒng, birth and death dates unknown), who was related to calligraphy sage Wang Xizhi (王羲之,pinyin: Wáng Xīzhī, 303 – 361 C.E.) of the Jin dynasty (晉朝, pinyin: Jìn cháo, 265 – 420 C.E. ), spent 30 years in the top part of the Yongxin Temple (永欣寺, pinyin: Yǒngxīn sì), located in today’s Zhejiang Province (浙江省, pinyin: Zhèjiāng shěng) in Eastern China, doing nothing except studying calligraphy. Figure 2. Detailed explanatory notes on rinsho study of the “Letter carried by the wind” (風信帖, ふうしんじょう, fūshinjō), mentioned in Figure 1. 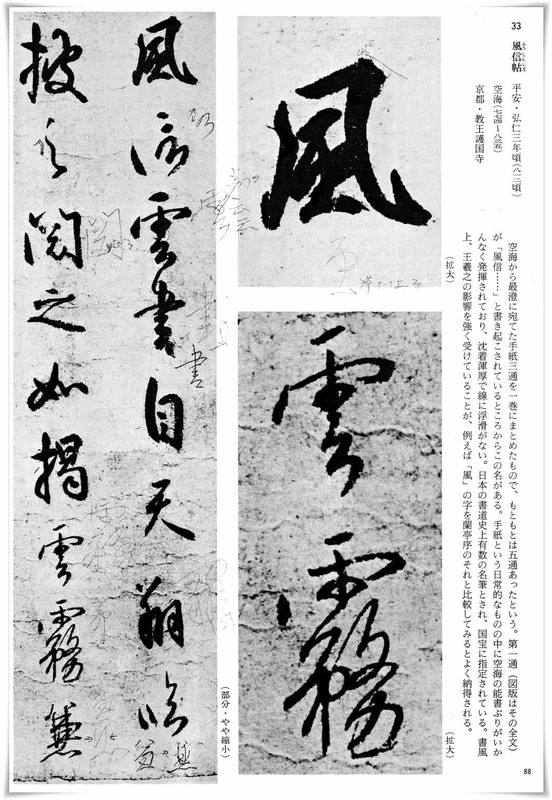 This is a fragment of a book titled Shodou Geijutsu (書道芸術, しょどうげいじゅつ, shodō geijutsu, i.e. “The Art of Calligraphy”) in which almost 70 masterpieces are explained in detail. I received it from my teacher, and you can still see the pencil remarks made by him, then his wife, and now by me. Countless times I have forgotten to eat, completely immersed in studying rinsho. It is a great sensation, like entering a deep surreal dream or a plane in another dimension, far from this world and where reality is designed purely by the power of brush strokes. The characters suddenly come alive and tell me their colourful stories, shyly revealing their secrets. They will, however, speak only if you know how to listen, which is a state only achieved by losing yourself in the masterpieces. East Asian calligraphy starts and ends with rinsho. It assists you in building your own style (書風, しょふう, shofū), which matures throughout years and years of practice, and it is further enriched by life itself and whatever events you may encounter. Calligraphy is very closely related to martial arts. Bruce Lee once said: “It is not me who hits. My fist does it by itself.”. The same applies to sho (書, しょ, i.e. 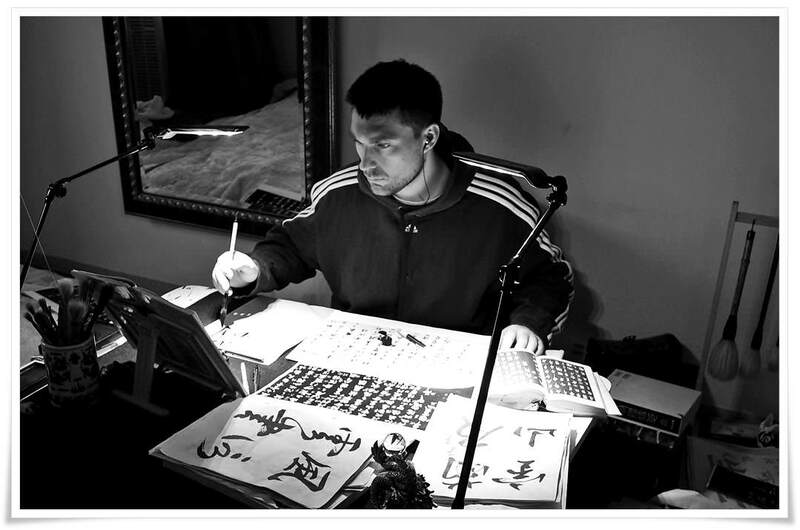 “writing”, here; “East Asian calligraphy”). Lifelong practice makes the brush a part of your mind, a true voice of your feelings. The moment you stop controlling your brush with your thoughts, you begin to understand the essence of calligraphy. You see and sense what and how you write before you actually move a muscle. Alas, such an advanced level of mastery cannot be reached without practicing rinsho. Without rinsho, your sho will be like modern movies or pop music. You will repeat the same patterns and strokes in each work, making your “art” look dull and weak. True mastery comes when one can write calligraphy in various styles, changing brush techniques seamlessly, merging the knowledge of all five core calligraphy scripts in each brush stroke. Figure 3. Twenty characters 之(pinyin: zhī, possessive particle) that appear in Lantingji Xu (蘭亭集序, pinyin: Lántíngjí Xù, i.e. “Preface to the Poems Composed at the Orchid Pavilion”) by Wang Xizhi (王羲之,pinyin: Wáng Xīzhī, 303 – 361 C.E.) of the Jin dynasty (晉朝, pinyin: Jìn cháo, 265 – 420 C.E.). 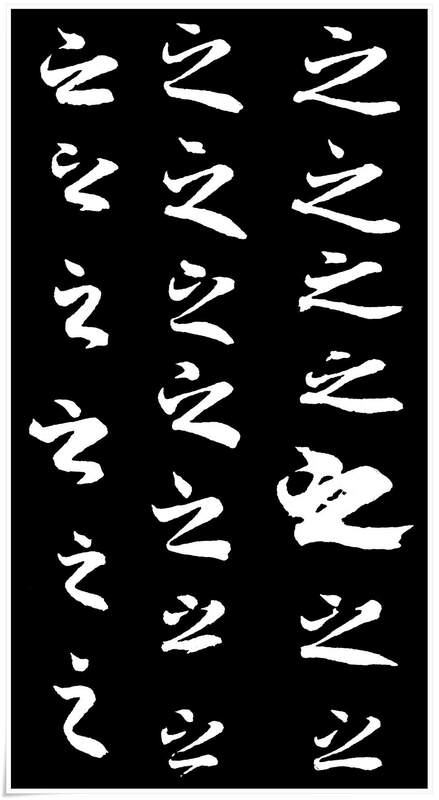 The most renowned calligraphy work, Lantingji Xu (蘭亭集序, pinyin: Lántíngjí Xù, i.e. “Preface to the Poems Composed at the Orchid Pavilion”), attributed to the above mentioned Wang Xizhi, has the character 之 (pinyin: zhī, 之 is a possessive particle) appear twenty times. None of them is written in the same manner, though all of them are in perfect harmony with his extremely emotional semi-cursive script (行書, ぎょうしょ, gyōsho). In fact, all of the characters within this masterpiece seem to be individual entities, imbued with their own life, yet while reading, they eyes flow smoothly from one character to another, like clouds pass on a blue sky. The attunement to nature in his work is so flawless that it is hypnotizing (Figure 3). Confucius (孔子, pinyin: Kǒng Zǐ, 551 – 479 B.C. ), a great thinker and social philosopher of The Spring and Autumn Period (春秋時代; pinyin: Chūn qiū shí dài, 771 – 476 B.C. ), once said, in regards to his attitude towards studying in general, “How could I go on without you even for one day” (愛不釋手, pinyin: ài bù shì shǒu). How beautifully expressed. I study calligraphy every day. If I don’t, I feel sad or even guilty, as if I have betrayed my best friend. There are days when you won’t be able to study calligraphy, but it doesn’t mean that you cannot think or read about it. I often catch myself writing characters on the bed before I sleep, or closing my eyes and writing them in my mind. I usually begin my study with rinsho. It is as important as breakfast before I start my day. It ignites my soul’s engine. Figure 4. A larger fragment of the Lantingji Xu by Wang Xizhi (王羲之,pinyin: Wáng Xīzhī, 303 – 361 C.E.) of the Jin dynasty (晉朝, pinyin: Jìn cháo, 265 – 420 C.E.) mentioned inFigure 3. Note the circled character 風 (かぜ, kaze, i.e. “wind”) in the last row, and compare it with the one shown in Figure 2. The connection between those two is evident, yet they differ in a way. This example shows how skillfully Kuukai (空海, くうかい, Kūkai, 774 – 835) utilised his knowledge of calligraphy masterpieces by successfully merging them with his personal style. Continuity is the essence. A few minutes with a brush in your hand is better than studying calligraphy for ten hours on Sunday and then taking the whole week off. Sho is comparable to rowing up the mountain creek. It progresses slowly, but if paused, it regresses quickly. It requires effort and patience, but the rewards will stun your mind and empower your writing. The art of calligraphy is slowly dying, as not many people have the time or desire to devote their lives to it entirely, which is what it takes to master it. I, on the other hand, could not imagine my life without it. In Part II of this article I will talk about how calligraphers should study rinsho, and how our hearts soak up this ancient knowledge, inhaling it through the tip of the calligraphy brush. This is perhaps your best article yet! It gets right to the heart of true traditional practice. I look forward to part 2. Thank you, Steve. The part II will be more technical. I want to focus more on methods of rinsho based on one example, though in the future, I plan on introducing a whole series of masterpieces with explanatory notes. I know that there is virtually no materials on this in English. A great article and makes understand that much more the ways of Eastern thought through their art, poetry and not but least calligraphy an art form I wish to seek direction. 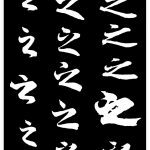 I am a brush painter and have done some calligraphy but could use some direction in how to study Rinsho as you have explained. Where do I start?…copying, practice of form etc…books recommended? Much respect and thanks. Great article indeed, thank you for sharing us the principles of the Rinsho and your way to practice it in your art & your personal life. May I know more about the book 書道芸術 ? I am interesting to buy this book, and It will be helpful to get more details about it, like its ISBN.